This will be in the next edition of the Miles and Minutes Running Magazine. You get it early though, as I wrote it and published it with the department head from school. Music pumps us up and helps us get through those long, tough miles. It gets our adrenaline flowing and heart racing. It helps us cross the finish line energized and ready to take on the world. But what if there was another kind of ‘beet’ that could help us really dig down and give it all we’ve got? Maybe even shave a few precious seconds, or dare I say minutes, off our chip time. Would you try it? Most of us are accustomed to the pickled beets that act as salad toppers, tasting like vinegar and ready to stain your favorite shirt. I don’t think anyone liked them as a kid and few of us like them as adults. But what if they gave you that extra edge, that extra oomph to achieve the speed goal that seems just out of reach? What if they gave you some extra grit in your soul to go another mile? And what if it didn’t taste like vinegary dirt? Now we’re getting somewhere. 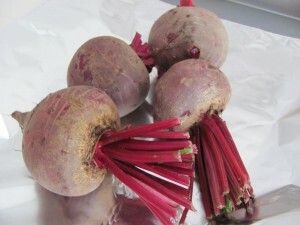 Beets are one of the richest sources of dietary nitrates. Recently, research has shown that nitrates may improve blood flow throughout the body. Researchers found that beetroot juice enabled people to exercise roughly 16% longer because of the nitrates’ ability to reduce oxygen uptake, making exercise less tiring. Via a system of chemical reactions, your body converts the nitrates in the beets into nitric oxide in your blood. Nitric oxide expands arteries and improves oxygen delivery to working muscles (1). Consuming whole beetroots has also been shown to improve running performance and perceived exertion (2). The good news is that we can get performance enhancements from consuming whole beetroot and juice without relying on questionable supplements, which may have adverse health effects. Plus eating whole foods like beets can provide additional health benefits, such as decreasing blood pressure (3). And remember that dark red color that stained your shirt? It turns out to be a potent antioxidant, a type of phytochemical called anthocyanins. The more color a fruit or vegetable has, the more of these phytochemicals are present, making beets a great source! The biggest side effect of eating beets, or drinking beet juice in normal doses is “beeturia” which is the technical term for passing red or pink urine after eating beets. Don’t be too alarmed if you notice some of the red dye in your stool as well. Now, this may be a little unsettling, but since it poses no harm just keep humming to the “beet” and enjoy the fast splits in your next race. So how much do we need? Research shows that 16-20 oz. of beetroot juice is the best “bang for your buck” dose, and it has the most effect on blood nitrate levels between 2 and 3 hrs. after consumption.(4)(5). If you’re eating whole beets then the beneficial effects can be seen by eating just 1.5 cups about 75 minutes prior to exercise. Fresh beets can be purchased in the produce department, sometimes with the greens still attached. You can use the greens in your salad and then go to town on prepping the beets any way you like. Slicing them like an onion and then chopping the slices into strips will help them cook faster. Try them in omelets, soups, stews, roast them in the oven with other colorful root veggies, and even making a beet and sweet potato casserole. The simplest way to cook fresh beets is to trim them. Place in a pot with 3Tbs lemon juice and cover with water. Bring to a boil and then simmer until tender, about 50 minutes. Place under cold running water, peel and enjoy. If washing, chopping and cooking beets is too much work for you, most grocery stores sell beets in a jar or can with just water. No vinegar. No salt. Just beets! And they’ve been cleaned and sliced for you! They are softer and ready to put into any hot dish at the last minute or eat cold. Don’t throw out the water though. That water is chock full of nitrates too. You might actually see bigger gains by drinking that juice than eating a cooked beet. And if you really love beet juice, you can buy it in a convenient re-sealable bottle to take with you to the gym, road or trail. (1) Wylie LJ, Kelly J, Bailey SJ, Blackwell JR, Skiba PF, Winyard PG, Jeukendrup AE, Vanhatalo A, Jones AM. Beetroot juice and exercise: pharmacodynamic and dose–reponse realtionships. Journal of Applied Physiology. 115(3):325-36. (2) Murphy M, Eliot K, Heuertz R and Weiss E. Whole Beetroot consumption acutely improves running performance. Journal of the Academy of Nutrition and Dietetics. 112:4, 548-552. (4) Bailey SJ, Fulford J, Vanhatalo A, Winyard PG, Blackwell JR, DiMenna FJ, Wilkerson DP, Benjamin N, Jones, A. Dietary nitrate supplementation enhances muscle contractile efficiency during knee-extensor exercise in humans. J Appl Physiol 109:135-148, 2010. (5) Bailey SJ, Winyard P, Vahatalo A, Blackwell JR, Dimena FJ, Wilkerson DP, Taff J, Benjamin N, Jones AM. Dietary nitrate supplementation reduces the O2 cost of low-intensity exercise and enhances tolerance to high-intensity exercise in humans. Journal of Applied Physiology. 1-7(4):1144-55.